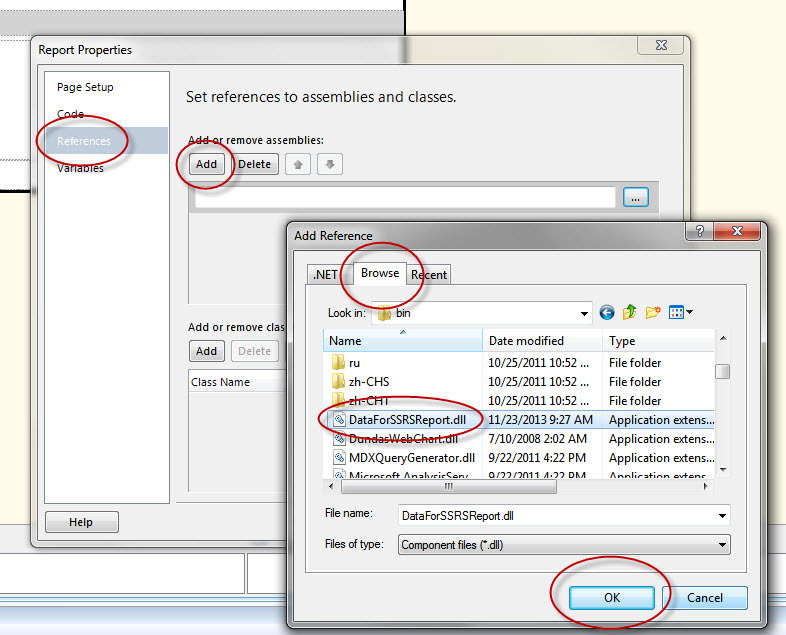 1) Create an external Assembly DLL (Class Library). You can use Framework 3.5.
b) Rename the default class to ‘clsDataForSSRS’. Make sure the class is Public. 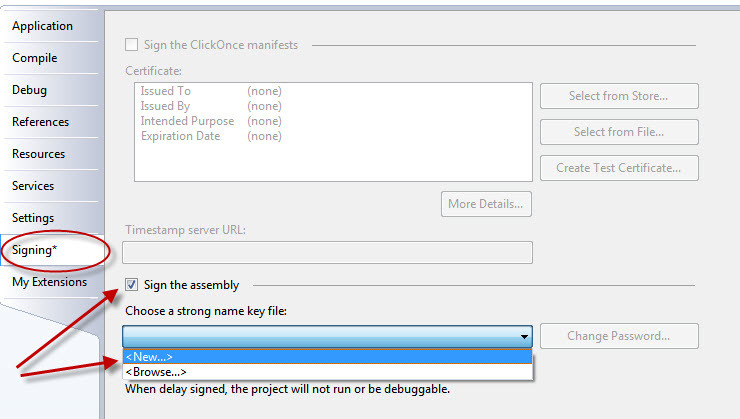 2) Setup a strong name to sign or version the assembly. Do not password protect. CD "C:Program FilesMicrosoft SDKsWindowsv6.0ABin"gacutil.exe -i "C:Program FilesMicrosoft SQL ServerMSRS10.MSSQLSERVERReporting ServicesReportServerbinDataForSSRSReport.dll"
7) Using the Business Intelligence Development Studio add-on, create an SSRS report (RDL). 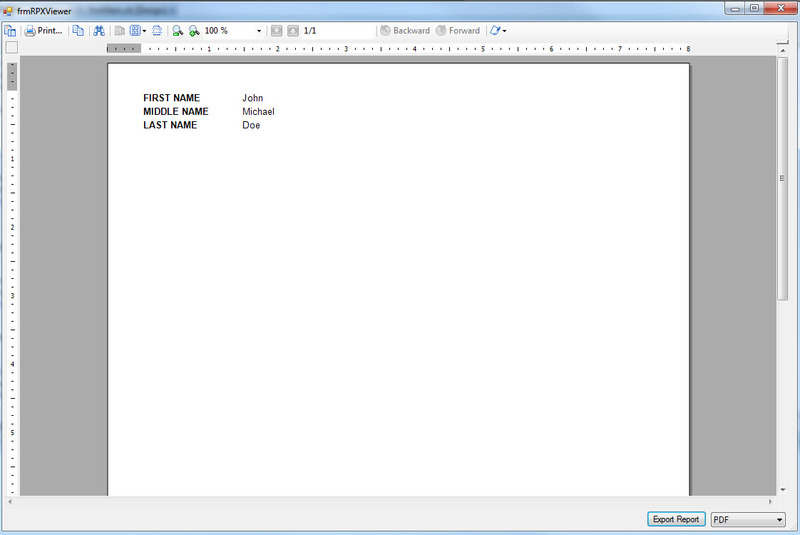 Place a textbox on the report that will be populated with data from the DLL you created, ‘DataForSSRSReport.dll’. 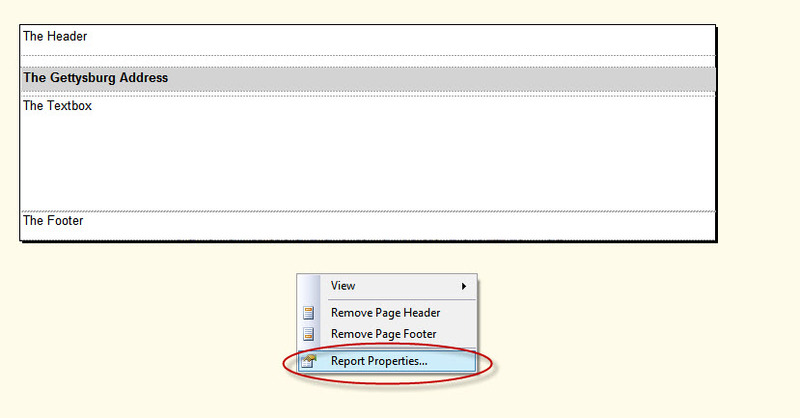 8) Right click outside the body of the report, and then click on ‘Report Properties’. In the ‘Report Properties’ dialog box, click ‘References’. Click the ‘Add’ button. In the ‘Add Reference’ dialog box, click the ‘Browse’ tab. 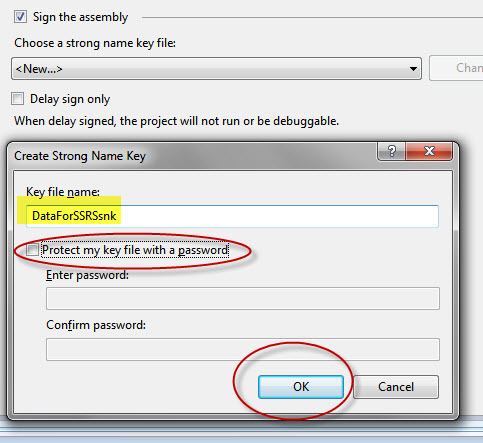 Navigate to and select the DLL you created, ‘DataForSSRSReport.dll’, then click the ‘OK’ button. Finally, click the ‘OK’ button on the ‘Report Properties’ dialog box. SSRS will actually use the GAC to get the DLL. Any time a change is made to the DLL, repeat steps 4 through 6, and then you must close and reopen the Business Intelligence Development Studio to test it again locally. Active Reports – How to access a public variable on a parent report from a sub report. UserData is a public object of the DataDynamics.ActiveReports.ActiveReport. Let’s say you are using a Watermark in your parent report. The Watermark is embedded into your parent report at design time. You want to share this Watermark with your sub reports. To do this, store the image of this Watermark in the UserData object. Now it can be accessed by a sub report. In your sub report, you may want to display the Watermark depending on some condition. Active Reports – Sub reports overlapping each other when rendered. If you are like me and have a report that dynamically calls a sub report that then calls sub reports (using the sub report control), you may have run into the occasional sub report overlap nightmare. The latest encounter for me had to do with textboxes on the sub reports having properties of CAN GROW, MULTILINE, and WORD WRAP. Because these textboxes can grow, depending on whether these textboxes are populated with data less than 5 characters or many characters, overlapping the next sub report can occur. With trial and error, I have found two solutions to the problem. You could even use both solutions to cover all bases. Before I get into explaining the solutions, let me give you more background on what I am trying to accomplish with these reports. The image below represents a sub report that is called dynamically from the parent report. Based on my experience and knowledge (I could be wrong), sub reports cannot call sub reports dynamically. If they could, I would not have written this article and you most likely would not be reading it. Instead, I had to drag ten sub report controls to the surface of this sub report. Notice how all the sub reports are flush to the left and bottom of the previous sub report (Well, except the last one for the purpose of presentation). This could potentially cause overlapping nightmares, especially if these reports have textboxes that CAN GROW. Without going into the whys and how comes, I am simply going to offer my solutions. The image below represents a small amount of padding I placed between each sub report control. 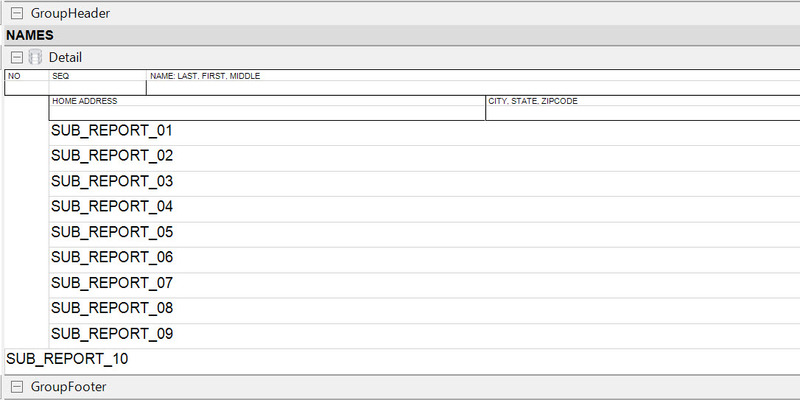 The reason I have such a small amount of padding is because the white space will take up real estate on the rendered report and can look ugly if the gap is too big. This small gap is exactly what you need to fix the problem. Do you want double insurance? The second solution expounds on the first solution. The image below represents placing a line control (make it INVISIBLE) between each sub report in the gap we provided in the first solution. The line control ensures that the previous sub report renders completely. 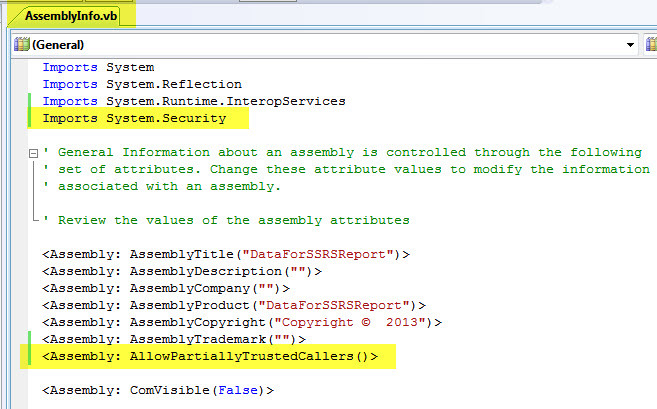 Instead of passing a parameter to a report with a value set to preexisting data, you can instead prompt the user running the report with an inputBox (Microsoft.VisualBasic) in order to capture the data on the fly to be used in the report. 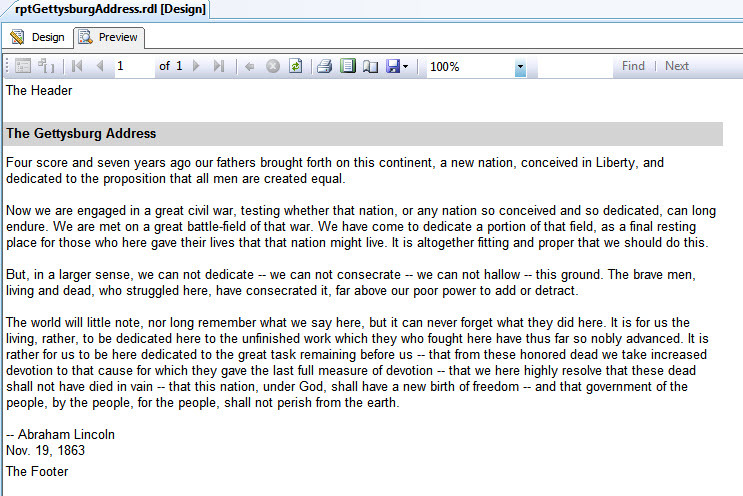 In the VB script behind the design, dim three variables that will hold the values entered via the inputBox. 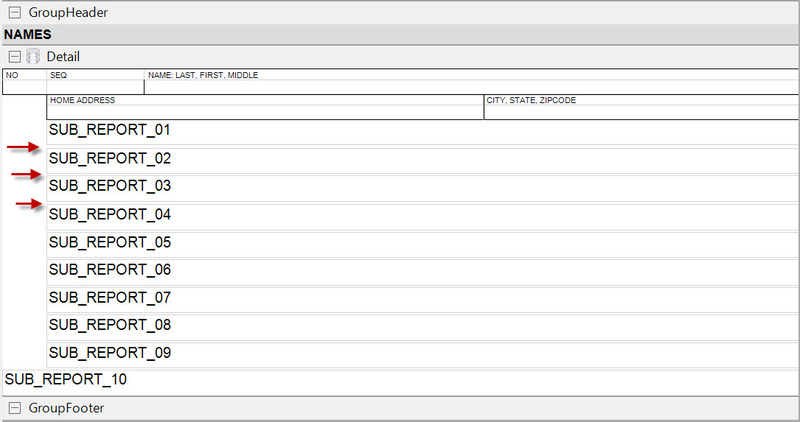 In the ReportStart sub routine section of the report, write the code that will prompt the InputBox. After clicking “OK”, two more inputBox’s will appear for the Middle and Last Name. You can get the code here. The file is called TestInputbox.rpx.